Monte Castello di Vibio clearly retains the look of a medieval castrum. It stands on a hill, which offers a unique view of the hills of Umbria and the Tiber valley. From afar, despite some newly-built houses and farmhouses, the village, topped by the colour of the antique red roof tiles of its beautiful stone dwellings, is surrounded by green countryside. Flashes of light, shadows, and that of twilight strike the visitor while walking along its narrow streets, going around the fourteenth century Tower of Porta di Maggio, the medieval well-cistern, the portal of its former sixteenth century monastery; and all the other details that capture the visitors attention. Inside the Church of Santa Illuminata, once a seventeenth century oratory, now with nineteenth century modifications, is a miraculous crucifix, already described in a Gothic manuscript, that is venerated . Talking about miracles, we would like to mention the nineteenth-century parish church dedicated to San Filippo and Giacomo, which preserves the statue of the Madonna dei Portenti, so called for its miraculous properties that were recognized by the inhabitants. The square of the church, dedicated to Vittorio Emanuele II, is like a balcony over Umbria. A region that almost seems designed and of which, at certain moments, you can hear the voice, a motherly voice, that alternates with the silence of land. Thanks to the presence of many ancient towers and Guelph merlons you can understand that the village was a papal fiefdom. 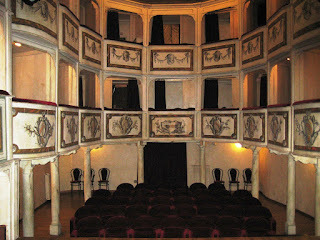 The citizens of Monte Castello succeeded in building a theatre at the beginning of the nineteenth century, which in 2008 celebrated its bicentenary. 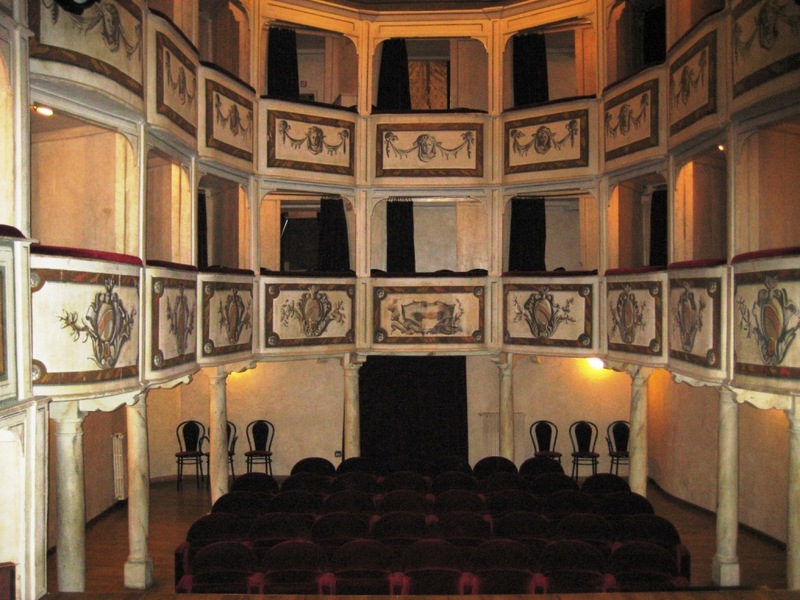 Teatro della Concordia was designed during the French post revolutionary period and reflects the soul of the village in miniature. It is an intimate place, a masterpiece frescoed in 1892 by the young painter Luigi Agretti (1877-1937), who was spending a holiday in Monte Castello; he was the son of Caesar from Perugia, already the author of the decorations of the drop-curtain and the backdrop of theatre. In addition to the vaulted ceiling and the foyer of the theatre, Luigi Agretti also painted the apse the Church of the Santa Illuminata. You can not leave Monte Castello without a visit to the beautiful hamlet of Doglio, placed even further up the wooded hill on the road to Todi. Doglio was a castle of the Ghibelline of Todi that that overlooked the Guelphs of Orvieto. There is a stone coat-of-arms with the eagle of Todi on the fourteenth-century Porta Fuje, from which you can enter the old village. You can also admire the wonders of a place that has remained intact over the centuries.